I got a message via Facebook from, Jimmy, a friend who was looking for a drawing of a rat. He’s just beginning a computer business in Ocean Grove, a section of Swansea, MA. It was a fun drawing to do. I began with some quick sketches in my sketchbook. Once I had a direction that I wanted to go I just penciled it in and then ‘inked’ it with my trusty Sharpie. I showed it to Jimmy and he loved it. The next step was to scan it and get it into Photoshop to clean it up. Then I placed it in Illustrator, traced it, and cleaned it up to get it ready to add color. The finished drawing is pictured on the left. 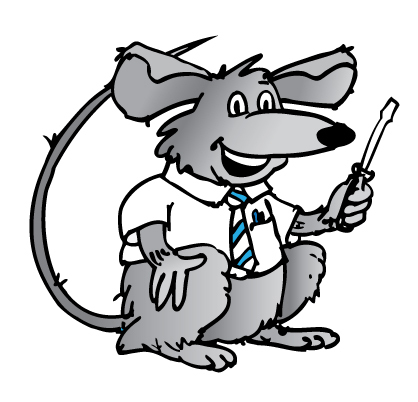 Jimmy wanted a light-gray rat so there isn’t a lot of ‘color.’ I hope it helps him begin his new venture in computer repair. Previous Previous post: $1,165 raised!